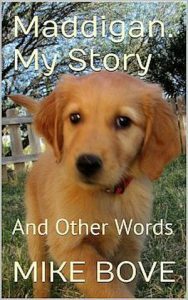 MADDIGAN – MY STORY is part one of a golden retriever’s memoir written in the dog’s voice. AND OTHER WORDS is a collection of short essays, blog posts, reviews, and recipes. It includes chapters from the two Bruce DelReno Mysteries, and a preview from the third. And, Mike reveals his secret recipe for limoncello. This volume is a collection of stories, essays, blog posts, and other short pieces that I have written over several years. Some have appeared in print elsewhere, online, in letters, or simply resided in my computer. Some are social commentary more about baseball and nonsense than politics or religion. There are bits that could be in my biography, though that is not the intention. There are serious topics on which I offer brief opinions, but mostly the intentions are attempts at humor. The humor part is always funny to me, but some folks do not get it. Each piece in this collection had its own inspiration. Together it shows more of my varied interests and opinions than comes through in my mysteries. Some of this is nonfiction and came from wanting to share observations I made in places I had visited. Maddigan is a real puppy and she made me write about her by being so cute. Some characters in my mysteries are loosely based on real people I have known. Others are made up to fit into a role in the story, but they may resemble people I have known. For example, Bruce's wife and my own are left-handed nurses. Besides being beautiful, caring women, not much else is similar. The villains are completely made up. There he goes again. Always writing, everyday a new tidbit of my life put into that little blue book with the wire coil. I tried to get it once. To see if I could tear all the pages off the coil. He sometimes tears off just one, crumples it and tosses it in the red wastebasket. I got some of those, lots of them until he put the basket in the closet with all of the other neat stuff I’m itching to get my jaws and paws on. He writes my name a lot. I can’t read, but I know it is my name because he sometimes says what he’s writing out loud. Sometimes he only mouths the words, but I am a good lip reader for my age. I am seventeen weeks old; they tell everyone four months. When I say ‘they’ I include his wife. They say they’ll feed me at five o’clock, but some times I wait until twenty past. Maybe it is because they are old and forgetful. They forgot where I was one time while watching the news at dinnertime. I was four months and over thirty pounds and I got a juicy boneless chicken breast off the kitchen counter. They found me sucking the last moisture out of the paper towel. Of course I got away with only a brief scolding since I was only still a puppy. A cute four month old golden retriever. My name is Maddigan. They call me Maddi. Of course, the first week I was with them I didn’t have a name. Oh, I had one, but they didn’t like it and I don’t remember what it was. It could have been Brittney, or that could have been my sister’s name. They could not decide on a new name for me and looked in books and on the computer a lot. I hoped for a good one, since possibly I would be called it the rest of my life. I like it. Maddigan. Maddi. Mad Dog! He wanted to name me Tsu. Not S-U E, short for Susan, but spelled T-S-U, short for tsunami. I went head first, full speed after everything I could see or smell. They smiled and giggled, but I could tell they did not like it much. Too bad, I want to check out mostly everything I see and go at it with open mind and mouth. Except the cat, she was bigger than me when I got here and hisses and claws if I get close. I figure if she leaves me alone I can do the same. I’m getting ahead of myself. I want to go back to the beginning, before they met me. They first saw me when I was just six and a half weeks old. I lived in Queen Creek for forty-six days before they showed up and took me away from my mom and six brothers and a sister. Another brother and sister disappeared that same day. I don’t remember ever seeing my father, but people that came by and petted us and let us piddle on their feet said he is a dark and handsome stud, whatever that means. My mom is a small dark golden retriever, not a blonde. They say she had a hard time with us. You know, pushing out ten kids and nursing us. We were always hungry, I know I was. Mom’s name is Charlena, but they call her Charley. We all stayed outside, where I was born, in a nice fenced in grass yard. My new people were told Charley was all worn out from us kids and climbed onto the picnic table at night so we couldn’t get to her. That is true. It was fun being there with my brothers and sisters. We climbed all over each other even after we could see. We climbed into the big bowl of food and the water bowl. Now I have my own, but the cat thinks my water bowl is hers. I don’t mind because she can’t drink much with that tongue technique. My sister with the red splotch on her head and me with a blue splotch were the only two girls my mom had left that day my new people came for me. The owner of all us dogs has a daughter who is nice. She took the most care of us and got to pick one of us to keep in Queen Creek. She picked red. My new people gave the owner of all us dogs some money. I hope it was a lot. She gave them a bag of food, some papers, and a towel I liked with smells of my family and Queen Creek on it. They took that stuff and me to their white car leaving the nice girl, who didn’t pick me, and what was left of my family in the only world I knew. The girl cried. Me, too. I cried a lot more during the long time in the white car. They live far away in Cottonwood. That’s way past Chandler and even Phoenix. I cried, squealed, and tried to bark. They must have known I had to pee badly, because we stopped at McDonalds in Anthem and I peed a gallon in the parking lot. The rest of the trip went quickly because I must have fallen asleep. It was dark in Cottonwood. I followed them into their yellow house. They trusted me to stick around without a leash. No problem, I was staying close. I did’t know anyone in Cottonwood. I didn’t know what a leash was. I do now, I can’t go anywhere without it, I even drag it around in the house so they can pull me away from things I really want to chew. Goodbye, trust. Anyway, I got some food and water, and there were no greedy pups competing for it. I didn’t have to gobble it up, but I did just in case. The cat was bigger than me but I was not scared. I walked over to her and she swatted and missed, hissed, and ran away. I could tell she did not like me, thought she owned the place. Then they brought me outside because I peed on the rug and I did not have to pee again. So we went back inside and my new people went into what they called a bathroom. I followed. They put a nice big bed in there and said it was mine to keep. I cried and cried after they left me there. I was a prisoner because of the barrier in the doorway. I squealed, and scratched the floor and the barrier. I made such a racket because I hoped the neighbors would hear me and think I was being tortured, and then come save me. They did not come and I fell asleep. I woke up later and started the tirade again. My people thought I had to pee. I did, and pooped as well.